The weather has been absolutely beautiful this fall! I love the gently crunch of the leaves under my feet and the musty aroma of the fields past harvest. The geese have started to trumpet across the sky and the night air is cool and fresh. So what better time to bring in the harvest and roast a chicken! Cut all the vegetables into ~1″ pieces (larger if you have a large chicken because you want to vegetables to be done when the chicken is done). All my vegetables and my chicken were local. In fact, the vegetables (except the onion) came from my back yard! Rest the chicken on top of the vegetables. 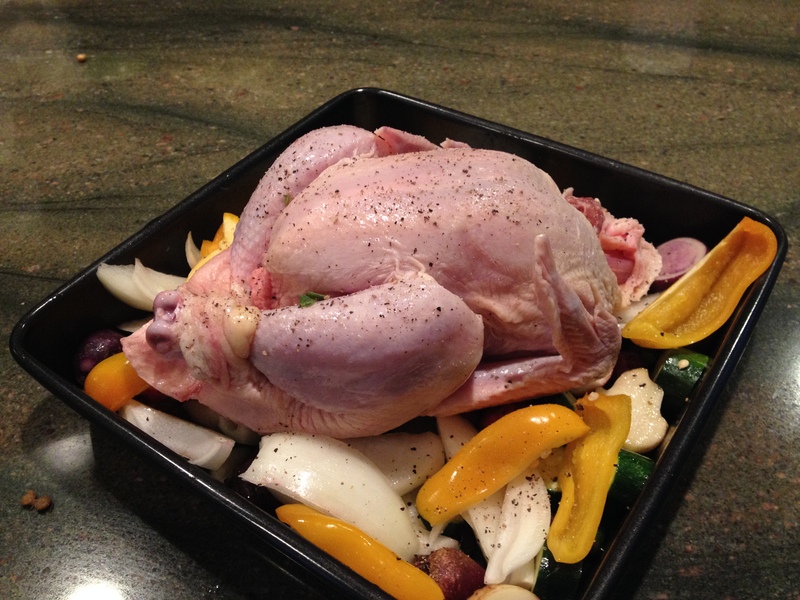 This eliminates the need for a rack and allows the chicken juices to marinade the vegetables as they cook. Sprinkle it all with salt and pepper and drizzle with olive oil. The sage goes everywhere too! I stuff some inside the chicken cavity and mix into the vegetables. Bake at 375 degrees. Use a meat thermometer to check that you have cooked your chicken long enough. Or, you can do like I do – wiggle a leg! If it is ready to fall off, then your chicken is definitely ready! (this method assumes you are checking fairly frequently so it doesn’t overcook). OK, I’ll come clean: I don’t time it. I look at it after I start to smell it cooking. At this point, you will see the chicken and vegetables appearing to cook but there won’t be any juice to use for basting. So leave it alone and go do something else for a while. But don’t go too far away because when you start to hear some “sizzling”, that means the juices are starting to be released. Now you can baste the bird, if you want. But, if you drizzled it with some olive oil, you don’t really need to. When it is getting very aromatic and brown and juicy, take it out and wiggle the leg! If the skin is tight, you might need to wiggle a lot. As a small, locally raised chicken, mine was rather lean (not at all like the yellow chicken by major national brands) and it wasn’t until I pierced the skin around the leg that it wiggled free. Now for the best part! Make your own croutons by cubing some good bread (I used french bread and multigrain bread together), toss with olive oil and bake for 10 minutes in the oven with the chicken. Line the platter with the croutons and then cut the chicken off the bones and place it over the croutons with the vegetables. 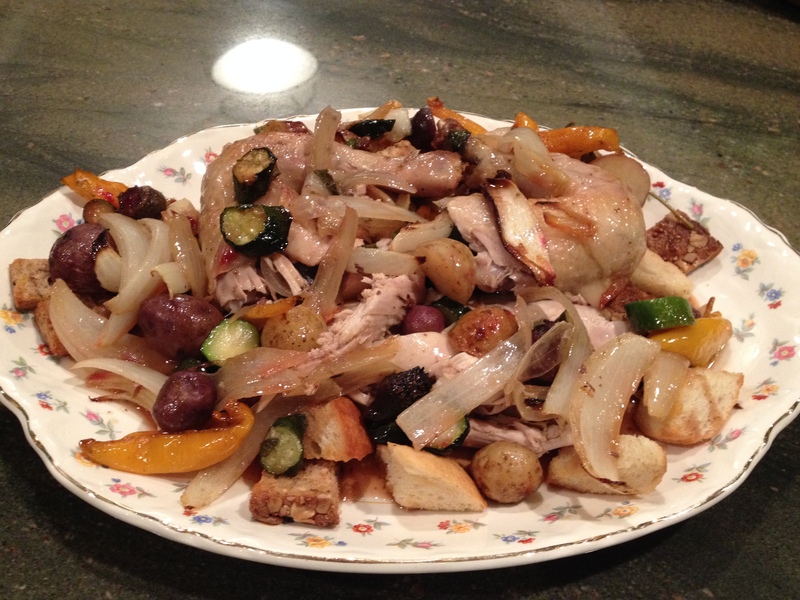 This idea was inspired by my friend Julie, who served us a delicious dinner of chicken roasted from a recipe by The Barefoot Contessa. Thank you, Julie! Nina – thanks, it is yummy. Maybe for Thanksgiving? It sure could simplify that cooking extravaganza!